This is traditional Caribbean side dish that is very tasty. It’s served often in Puerto Rico and Cuba. Place the cassava in a large pot cover it with water and add the salt and lime or lemon juice so that it does not discolor. Bring the pot to a boil, then turn the heat down and cook until the cassava is al dente 30 minutes or so. Meanwhile, chop the onion in small pieces. Heat the olive oil in a sauce pan, add the onions and sauté until glassy. Add the garlic and vinegar. Lightly add a pinch of salt and black pepper. Drain the cassava and place in a serving dish. Pour the mojo over the cassava. 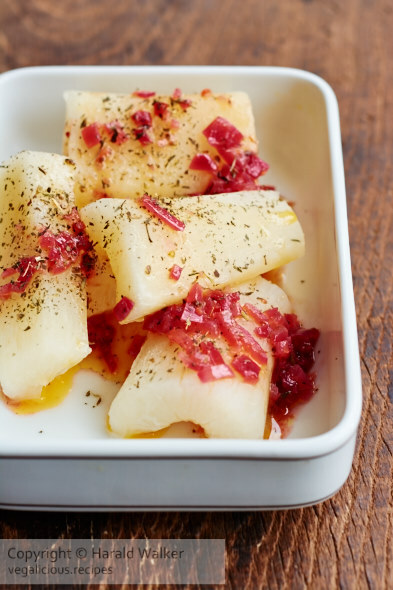 Posted by Chris Walker on June 12, 2015 in Cassava, Side Dishes.